Do.com is a social productivity app backed by Salesforce.com which allows you to easily get work done with anyone. Create a project, assign team members tasks, and watch your project productivity rise while progress unfolds. Currently, this cloud-based productivity app is completely free. Signup for your free Do.com account now as this tool is packed with great features and will most likely become another fee-based SaaS service soon. 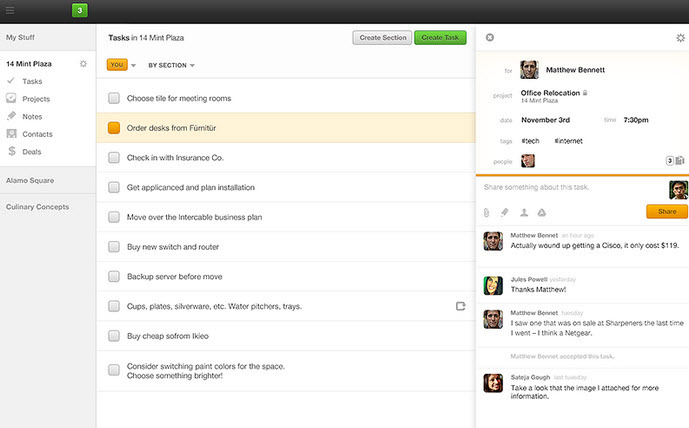 Do.com allows you to share task lists while organizing and prioritizing everything you need to do. Easily track and manage tasks from within a project. Whether you are in the middle of a business meeting or just need to jot down a grocery list reminder, you now have the ability to take notes quickly and access them from any device with Do.com. Additionally, you can send or attach documents to projects, contacts, or tasks. With Do.com, you can now leverage your social network contacts to get stuff done. Track opportunities against your contacts, customers, and companies and watch your revenue soar. Create alerts to stay on top of all your tasks in Do.com. You can also setup an email digest to outline your activity on a regular basis. Setup groups and add members to start sharing your work. Collaborate with your Do.com groups to give and receive feedback in the cloud. Reuse repeatable projects and task lists. Create a Do.com template to quickly setup your next project and improve your productivity. Receive real-time updates to stay on top of your projects and tasks. Always know the current status and progress of your Do.com projects. Sync tasks to your calendar and see when important due dates are approaching. Instantly create a task by forwarding email to Do.com. Seamlessly integrate Do.com with Salesforce.com and increase your CRM productivity. Continue down the path of integration by connecting Do.com to your company’s Gmail and Google Drive (previously Google Docs). Access Do.com from your iOS or Android smartphone to access your projects and tasks. I signed up for a free Do.com account and I couldn’t be happier. Below is an example of what you first see when you log in to Do.com. I’m confident this tool will continually be enhanced as it is backed by one of the world’s most innovative companies, Salesforce.com. I’m excited to see how this tool turns out post-beta. If you’d like to stay up-to-date with Do.com’s progress, check out their blog or Facebook fan page. You can also follow Do.com on Twitter. Try out Do.com and add a comment below to share your opinion of this new social productivity app. The news about Do.com shutting down took many people by surprise. It was a great product that helped thousands of businesses. At this time, we would like to invite all former Do.com customers to migrate over to our web-based task management app, SQRES. SQRES makes it easy to create, share and keep track of tasks. It keeps your team members organized and your customers up to date. Feel free to call us at 877-333-2932 or visit us online at http://www.sqres.com to let us help you move your tasks over to SQRES.